I met some wonderful Bookstagram ladies is Sydney last week! 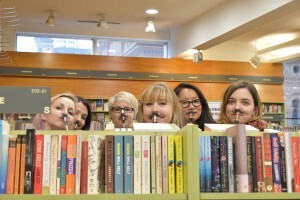 We visited some gorgeous bookstores around Sydney, and stopped in at the State Library of NSW to celebrate the 400th anniversary of Shakespeare’s death – by making paper mustaches of course! 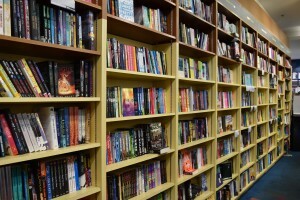 Have a favourite Sydney bookstore that I’ve missed? Let me know in the comments below so I can check it out next time I visit! The oldest library in Australia, the State Library of NSW is a must-visit for Sydney bookworms. 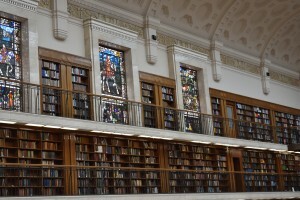 Established in 1826, when membership of the library had to be approved by a committee, 190 years later times have changed and the library is free to visit and open to the public. The library boasts some beautiful collections, including over 1100 copies of Don Quixote, and a room filled with Shakespere editions and some 17th century folios. X Factor: The main reading room will fulfill all your Beauty and the Beast library dreams, with high ceilings, bookshelves with ladders, balconies and a huge clock (in case you lose track of time while reading)! A lovely, light independent bookstore with new books on the ground floor and a fair selection of second hand titles upstairs. There is also a cafe conveniently located next door. This book has a very suburban feel to it, and when I visited on a Saturday morning was filled with people browsing across both levels. X Factor: Gorgeous glass case of antique books and special editions upstairs. My new favourite bookstore in Sydney! Part of the same chain as the Leichhardt store above, this 3 storey gem in hipster Paddington is definitely worth a visit. The ground floor has a great selection of new books, stationary and gift items, and a large childrens/YA area. The middle floor has art, design & architechure books, and a gorgeous little cafe with large windows overlooking the street. The top floor is packed with secondhand books in every genre, complete with cute little step ladders! X Factor: The atmosphere! 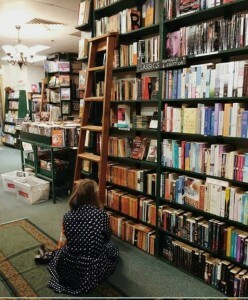 This is the kind of bookstore that makes you want to linger all day, with a cup of tea and a stack of books to browse. No visit to Sydney is complete without a wander through Kinokuniya. 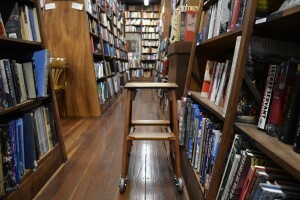 The Japanese retail chain has only one location in Australia, and it’s a brilliant bookstore. In addition to a huge YA section, excellent selection of literary novels, well-curated sci-fi/fantasy area, there is a massive range of manga, the biggest collection of Funko Pops I’ve ever seen and lots of great tote bags. X Factor: Dedicated Australian YA section! What’s not to love about a bookstore that highlights and supports local writers? 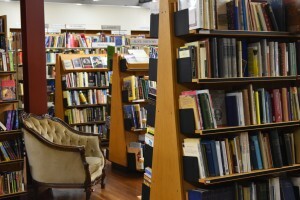 A sweet little secondhand bookstore in central Sydney, Elizabeth’s selection can be best described as ‘assorted’. The sections are arranged in the most haphazard manner, with Classics next to Erotica, which leads to some unusual pairings! It’s the kind of bookstore which just promises to have hidden gems if you have the time to spend wandering and slowly appreciating the selection. X Factor: Blind date with a book! Purchase a book wrapped in brown paper with just a few words as clues to the book inside, it’s great fun and wonderful for the indecisive. I love that Paddington Berkelouw too. Aries is still one of my favourites as is Abbeys, but what I wouldn’t give for Kinokuniya’s space and budget! Great post, thanks BB. Thanks Warren! I haven’t made it to Aries or Abbeys yet, but they are definitely on my list for next time I am in Sydney.